Given the unruliness of time machines, apt to choose their own destinations, you’ll need a bike, car or SEPTA to see the scattered sites where enslaved Black women helped to get colonial Philadelphia going. Take Black Alice, aka Alice of Dunks Ferry, who reached age 116, c.1686 to 1802, historians say. Her parents, from Barbados, arrived here in 1684 on the Isabella, the ﬁrst slave ship to reach Philadelphia. By age 5, Alice began serving drinks and oysters in a tavern and lighting pipes for its patrons, according to Susan Klepp, a retired Temple University history professor. Legend has it that when Alice lit a pipe for William Penn (1644–1718), he tipped her one pence, about 75 cents into today’s money. Years later, Alice’s master apparently moved her 17 miles upriver to what became Bensalem, where she eventually operated a kind of ferry called a horse boat. A strong, savvy woman by all accounts, she calmed skittish horses, handled rowdy passengers and collected tolls for 40 years. Alice never gained her freedom, but she may have used the ferry to help fugitives escape. She never fled herself, maybe because she had at least one child in Dunks Ferry, Dr. Klepp says. Alice rode to Philadelphia to attend Christ Church on Sundays, and she became an esteemed oral historian and storyteller who recalled Philadelphia as a tree-filled outpost of bobcats. Today, tours of Christ Church, 20 N. American Street, include Alice’s story. Visitors can also get an earful from her in a life-size video kiosk at the African American Museum in Philadelphia, 701 Arch Street. You need sharp eyes to spy some evidence of a Black colonial presence. You could easily cruise past the plaque at Germantown Avenue and Wister Street, marking the site of the 1688 protest against slavery, the New World’s first formal antislavery petition. Drafted by Quakers six years after Pennsylvania’s 1682 founding, the document criticized other Quakers for owning slaves. By 1700, 1 in 10 Philadelphians had slaves—including William Penn, who used them at his country home, Pennsbury Manor—historians note. Some Black colonial hotspots stand hidden in plain sight. Congo Square, later called Washington Square, 6th and Walnut Streets, received its earlier name because people of African descent socialized and danced there, according to Charles Blockson, founder of Temple University’s Blockson Black History Collection. Black Alice—perhaps wearing a “…waistcoat made of … cotton ...and a petticoat … seamed in the common way,” as suggested in “Rules for Cloathing [sic] and Feeding Negroes ”—may well have met with friends here. In 1732, the Philadelphia City Council passed an ordinance to limit Sunday slave “tumults,” as councilmen called the gatherings, this on top of the 1725 law for the Better Regulation of Negroes, which meant a storm of restrictions for free Blacks. For example, free Blacks had to turn their children over to justices of the peace to be bound out into their twenties. Colonial Philadelphians must have seen many Blacks going about their work. By 1720, some 2,500 Black people, most of them enslaved, lived in the city. By 1767, roughly 1 in 5 Philadelphia families owned a slave, according to Debra Newman Ham, former Black history specialist at the National Archives, Washington, D.C. A Black woman who cooked, cleaned, spun cloth and laid fires boosted a household’s status, Newman adds. The Museum of the American Revolution, 101 S. 3rd Street, offers a good overview of how the brewing rebellion affected enslaved women. 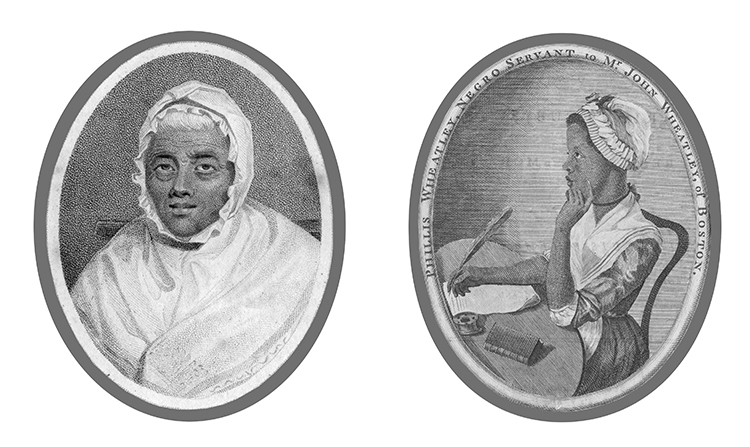 For Black women throughout the colonies, change bore down on two fronts. Enslaved writer Phillis Wheatley (c. 1753–1784) soared to stardom in April 1773—mere months before the Boston Tea Party in December—with the publication of her book, Poems on Various Subjects, Religious and Moral. Kidnapped from West Africa at about age 8, she was bought and educated by prosperous Boston merchant John Wheatley and his family. Though Wheatley died poor, she’d won her freedom and helped smash the myth of inherent Black stupidity with her book. Other exhibits show that for many Black women, the American Revolution meant a toss of the dice: Would the colonists or the British give them the best chance at freedom? Lord Dunmore, royal governor of Virginia, tried to undercut colonists in 1775 by offering freedom to enslaved Blacks who agreed to fight for British forces. Many who sided with the British migrated to Nova Scotia, Canada. A handful of Black women went to Africa. Others pinned their hopes on rebelling colonists. One such woman was Elizabeth Freeman, or Mum Bett (1742–1829), who sued for her freedom in a Massachusetts court in 1781. She won. Her case set a precedent that helped to end slavery in that state. Philadelphia has its own Black heroine who cast her lot with the colonists. The story goes that Dinah, freed in 1776, saved Stenton, 4601 N. 18th Street, the country home of James Logan, colonial mayor of Philadelphia, and his descendants. Weeks after the British won the Battle of Germantown in October 1777, a pair of British soldiers knocked on Stenton’s door and told Dinah, the housekeeper caring for the Logans’ palatial home in their absence, that they meant to burn down the house. The soldiers were in the barn gathering straw to start the fire when British officers rode up and asked Dinah if she’d seen deserters. “Yes,” she said, “two are hiding in the barn.” The officers arrested the soldiers and took them away, thus saving Stenton. Dinah has a plaque in her honor at Stenton, and she’s included in a mural on the north wall of the historic YWCA, 5820 Germantown Avenue. You can tour Stenton, a 3-acre site, recently featured in Antiques and Fine Art Magazine, and see original furniture Dinah could have dusted and dishes she could have washed. Stenton’s Annual Holiday Tea Party will take place Saturday, December 1, at 2 p.m. Call (215) 329-7312 or see information@stenton.org. From plaques to parks, museums to murals, Philadelphia offers glimpses of the lives of Black women whose forced labor helped make the city a colonial powerhouse.